On Wednesdays we are thrilled to fling open the doors to all of YOU! We love hearing your dreaming stories…the lessons you’ve learned, the roads you’ve walked, the dreams He’s planted in your hearts! Today we welcome back Regan Seward to God-sized Dreams. 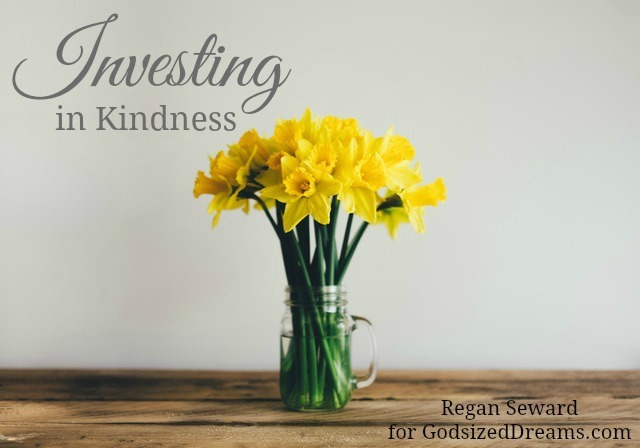 She shares how God has helped her to see the value of investing in kindness, even when others can be hard to love. Thanks for being here today, Regan! I stood there waiting at the deli counter for my two pounds of shaved turkey, just like I do every other Saturday. We all get into a routine and most of us find ourselves shopping at the same grocery store, and we begin to see familiar faces each time we go. Some weeks it’s the cashier or the door greeter, but this week it was the lady working behind the deli counter God chose to put into my path. The store was busy, and she was left all alone to do the job of three or four people. As I walked up, I could tell this was going to be a testing of patience on my behalf if I wanted to get my lunch meat. I could tell the employee was not having a good morning; she was stressed and short with the customers in line ahead of me. I could see the women in front of me were put off by the employee’s bad attitude, and they began to snap back in their response. 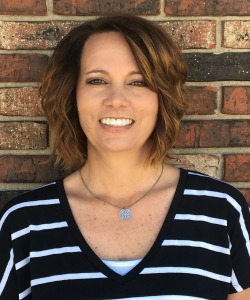 I stood there and watched as I waited my turn, and I quickly knew that, even though I was about to be greeted by a woman who was agitated and frustrated and what others might call rude, God was opening my heart to see myself in her. How many times in my own life had I brought my bad mood and baggage to town or work and taken it out on those around me? I had been exactly where she was, and I would imagine so have you. I began wondering what this woman may have dealt with hours before she came to work. Was she struggling with a sick child, maybe an unhappy marriage or battling a disease of her own? Had her finances failed her or had her brokenness from the past gotten the best of her this morning? The thing is, we as women have a hard time showing kindness when we feel offended or put off. When another woman speaks in a harsh tone to us, we instantly put up a brick wall of standoffishness. I am going to be even more honest here and say that we would rather not put ourselves out there because our own insecurities keep us in chains. Our hearts may be telling us to give this woman a compliment or offer her a kind gesture, but we believe our fears are bigger than the blessing. Are we really called to be timid and just walk away from the chance to lift the spirit of a sister in need? What if, before we left the comforts of our own homes, we prayed for a heart wanting to BE the blessing and not looking to BE blessed? We should be asking God to fill us with the ability to see ourselves in other women and to realize that, at the end of the day, we are all the same. How different our world would be if we left our critical and insecure attitudes at the cross. The truth is we are all battling something, and if we see each other as a vision of ourselves then it’s pretty difficult not to choose kindness. If we are walking close enough to Jesus, then we can be brave enough to lay aside our own insecurities to invest kindness into others. And in that moment, God will strengthen us from the inside out. Proverbs 31:25, She is clothed with strength and dignity; she can laugh at the days to come. Regan, I’m so thankful that God gave you the insight to view with mercy that beleaguered store employee. So often our impatience gets in the way of compassion. Thank you for sharing your words here! There’s always a huge return when we invest in kindness. always. That has been my experience.